A new service is being launched on the Gold Coast on April 12 that will help stop elderly people dying alone and unnoticed especially during holiday festive times, such as Easter and Mother’s Day. As people are increasingly living longer and their children are getting busier, more elderly people are being forgotten about in their homes and often die alone and unnoticed. 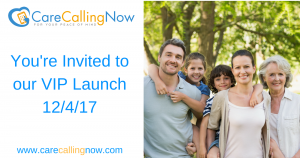 CareCallingNow does a daily welfare check by phone to elderly people across Australia to check in on them when family is absent or otherwise preoccupied. Please find a press release below. If you would like to attend the VIP launch at Sportshouse on Varsity Lakes, 337 Christine Ave, Gold Coast, on April 12 from 10 am to noon, please let me know for catering purposes. A NEW Australia wide service launching on the Gold Coast on April 12 will decrease the likelihood of elderly Australians dying alone and unnoticed in their homes this Easter. As Australians are increasingly living longer and their children were getting busier, more elderly people were being forgotten about in their homes and often die alone and unnoticed. CareCallingNow co-owner Irene Manson said from her experience, if an elderly person living alone fell over at home and was unable to get up off the floor, it was common that they could lie there for up to four days before someone noticed. “This won’t necessarily result in death, but at the very least, they will end up in hospital,” she said. Mr. and Mrs. Manson said their new digital calling system offering daily welfare ‘check-in’ calls ensured elderly people will be found. “The worst feeling isn’t being lonely, it’s being forgotten!” Mrs. Manson said. “This is a great way to keep people living independently in their own homes longer, which will save a lot of money in nursing home care. 2GB Sunday Night Radio Host/ Uniting Church Reverend Bill Crews said he had been hearing of increasing numbers of people being found dead in their homes over the past 30 years. “I had an elderly lady in my congregation fall in the bathroom and break her leg and no one knew for three days,” Rev Crews said. He said he thought CareCallingNow was great as it helped keep communities together. It’s very useful as people can put their phone around their neck and carry it with them. The automated service allows a busy person, who is unable to check in on their elderly family or friends, to have peace of mind and potentially save lives. One or two calls can be made per day at a time that is pre-determined by the loved one. All the loved one needs to do is push any number key on their phone to acknowledge that they are ok.
Three attempts will be made and if no one answers, there are up to two alternates where either a neighbour or someone close by will be notified. “If neither of those people responds, the client will be notified via a call or text and an email,” Mrs. Manson said. “CareCallingNow understands that life’s daily stressors can be difficult especially when trying to find time to touch base with your loved ones on a regular basis. Mrs. Manson said all that was needed was a normal phone and no other equipment. Especially in retirement, Mr. Manson – who played top-level basketball in Australia for 13 years, said it was important to keep active. “Many people I know who officially ‘retire’ die soon afterwards,” he said. He said he wanted to encourage people to be smart early when looking after themselves at home. “Interestingly, older people who live in nursing homes are 6 times more likely to fall than those living in their own community and the average health system cost for a 65 plus person who has a fall and goes to hospital in Australia is more than $6500,” he said. 337 Christine Ave, Gold Coast, on April 12, 2017, from 10 am to noon.